This story is from stepfeed, reported on July 4, 2018. You can link to the story here and it's pasted in below. The story is by Razan Mneimneh. For the first time since 1957, female members of Saudi society have been granted their right to get behind the wheel. It's uncommon to see an Arab dad making people laugh by clapping back at his haters online... Meet Khalid Al Othman, an outspoken Riyadh-based engineer with nearly 15,000 Twitter followers. Last week, Al Othman posted a picture of himself with his daughter behind the steering wheel, four days after the ban on women driving in Saudi Arabia was officially lifted on June 24. Since King Salman's September 2017 royal decree, the country has been busy setting up driving schools and holding events encouraging female members of society to practice their newly established right. "My first ride alongside my precious daughter after women officially started driving in Saudi Arabia," wrote Al Othman. Most people on Saudi Twitter rejoicingly replied to Al Othman and his daughter with positive comments. But alas, the negative comments also made their way through and the proud father handled them like a boss. "Darker than it already is?" - "Why don't you make your daughter wear the hijab and cover her hair? May God darken your face (humiliate you)." - "You want my face to be darker than it already is you blind man?" "Transportation has nothing to do with covering up"
"Covering up is my business and my daughters ... and by the way, public transport has nothing to do with modesty." Arabic puns at their best. "I placed the driving wheel on my daughter's side"
- "Are you the one driving or your daughter?" - "I'm the one driving of course, but I placed the driving wheel on my daughter's side." "She's lucky to have you"
On June 24, women in Saudi Arabia were finally given their right to drive legally after a long-standing ban was lifted by a royal decree in September last year. As part of Crown Prince Mohammed bin Salman's wide-ranging drive to modernize the country, for the first time since 1957, female members of Saudi society have been granted their right to get behind the wheel. The 32-year-old crown prince, who is heir to the throne, has spearheaded the Vision 2030 agenda to diversify the economy away from oil and open up Saudi society. Part of his plan is to increase female workforce participation from 22 percent to 30 percent by 2030, and allowing them to drive will be a vital component of that. Up until June 24, Saudi Arabia was the only country left in the world where women were not allowed to drive and families had to hire private drivers and chauffeurs for female relatives. Following the ban lift, viral footage that was widely shared online showed police officers handing out roses and giving their full support to the new female drivers. The rap song - titled "Tahsibni Amzah" (Do you think I'm kidding?) - was written and performed by Saudi social media personality Leesa A. "Don't forget that today is the tenth day (of Shawwal) and this means no need for taxis. I'm not kidding, today I can drive myself," Leesa raps in the music video. The video went viral almost immediately, amassing over a million views on Instagram and over 840,000 on YouTube. Gulfnews.com reports this story on July 3, 2018. A link to the story is here and you can read it below. The story is by Al Sherbini. Cairo: A car owned by a Saudi woman was set on fire in a Makkah village allegedly by men opposed to women driving, Saudi media reported on Tuesday, more than a week after women were allowed to drive for the first time in the kingdom’s history. A spokesman for the Makkah Police said that they had received a complaint that the car was the target of a dawn arson attempt in the village of Al Samd, Saudi news portal Sabq reported. “The fire was put out and the incident is being investigated by security agencies,” the official added without giving details. The owner posted a video of the burning vehicle and accused local men of being behind the incident, but did not name anyone. “The village youth torched my car because they oppose female driving,” a crying woman says in the video. The woman, who gave her name as Salma Al Sharif, appealed to King Salman Bin Abdul Aziz and Crown Prince Mohammad for help. The decision to allow women to drive is part of wide social and economic reforms championed by Saudi Arabia’s young heir apparent. On June 24, women in Saudi Arabia were allowed to drive for the first time, months after the Saudi monarch decreed lifting the ban on female driving. Conservatives frown upon women’s driving as immoral and un-Islamic. Manama: A Saudi young woman has composed a rap song “We Are Driving” to celebrate the lifting of the ban on women driving in the kingdom. In her Hijazi rap song, in reference to the western part of Saudi Arabia, Leesa celebrated the glory of the historic 10/10 date. The date refers the tenth day of the tenth month of the lunar-based Islamic calendar, Shawwal, and corresponds to June 24 when the ban was lifted. Don’t forget that today is the tenth day and this means no need for taxis. I am not kidding, today I can serve (drive) myself,” she sang. Leesa also offered safety advice to women driving on busy roads, stressing the importance of buckling up.Saudi and Gulf women on Sunday celebrated with the right of women to drive in the kingdom. The decision was announced in a royal decree in September but several months were alotted to prepare the logistics for the event, including setting up driving schools and finding experienced women driving instructors. Saudi Arabia also enacted a strict anti-harassment law to ensure the full safety of women drivers on roads. The Arab News sent a reporter to rent a car and report on how it's done. A link to the story is here and the story (with video) is pasted in below. It was published on June 29, 2018. Arab News' Mo Gannon went to find out how easy it was to rent a car as a foreign women in Saudi Arabia. Visiting from Dubai Mo went to a branch of Budget rent a car in Jeddah. AFP Riyadh reports on June 24, 2018 about one young Saudi woman starting to drive, Samar Almogren. A link to the story is here, and the text is pasted in below. It's midnight in Riyadh, and Samar Almogren is making her way across the city she was born and raised in. Women in Riyadh and other cities began zipping around streets bathed in amber light soon after the ban was lifted. Saudi Arabia ended its longstanding ban on women driving on Sunday - and the second the clock struck midnight, women across the country started their engines. "My name is Samar Almogren. I'm a talkshow host and writer. "I took off my niqab a long time ago. When I first decided to show my face on television, it did not go down well. My brothers were very upset. But my father supported me, and has always supported me in all of my life decisions. He's the one who encouraged me to study abroad. "I've driven in different countries before, and I have an international driver's license, but it's going to be totally different here. At home. "I actually hate driving. But that's not the point. The point is that it is my right. I can drive, and whether I choose to or not is another issue. "My whole body is tingling right now. To get in my car, to hold this steering wheel, after having lived my entire life, since the moment I entered this world, in the back seat... This is now my responsibility, and I'm more than ready to bear it. I've long depended on myself. "I always knew this day would come. But it came fast. Sudden. "I think this was the biggest stumbling block. I don't see any more obstacles from here on. Driving was the big one, and that's done now. "Everyone's already asking me to drive them to work or to come for coffee. It's going to be great to be able to take my mother around, rather than have her sit in the backseat with a driver who's a stranger. No, my mom isn't going to drive, at her age. We're going to drive her around, me and my sisters. We want to spoil her. "What's most important to me is that I can drive my baby around. It's the worst thing to me to have to entrust him to a driver, even though I'm always with him in the car. "I wore white tonight because it's the colour of peace. I feel like a butterfly... No, a bird. I feel free like a bird." The Washington Post covers women driving in a June 24, 2018 story by Kareem Fahim. You can link to the story here, and the text is pasted below. JIDDAH, Saudi Arabia –With her husband in the passenger seat and her daughter cheering her on, Dania Alagili guided her sport utility vehicle onto the King Abdulaziz Road early Sunday, breaking a barrier by becoming just another Saudi driver in the roaring traffic. Saudi Arabia allowed women to drive for the first time on Sunday, lifting a ban that was the last of its kind in the world and one that had come to symbolize the kingdom’s harsh subjugation of women. In an effort to modernize the country, Crown Prince Mohammed bin Salman has eased some social restrictions. And by the standards of the Saudi Arabia, an absolute monarchy guided by an ultraconservative religious creed, reforms that seemed like the barest of innovations – like the lifting of the driving ban or the opening of cinemas – are viewed by many here as revolutionary, if long overdue. That Alagili, 47, had earned her driving license 23 years ago, in the United States, did nothing to dampen the joy on Sunday of driving in her own city, on her own roads, on her own. Without the driving privileges, and dependent on men, “I felt heavy, tied back,” she said. She headed to her father’s house, knowing he would want to share the moment with his only daughter. “For women it’s a big deal. And for the men who supported us,” she said. Cars raced by on the King Abdulaziz Road, a harrowing stretch of freeway that is also perhaps an argument for reevaluating the driving privileges of some of the men in Saudi Arabia. "You’re doing great momma,” her daughter, Ahd Niazy, 23, said from the back seat. Hany Niazy, Dania’s husband, called the couple’s other daughter, Layal, 19, who lives in Washington, D.C. Her face appeared on his phone. “Momma how do you feel?” Layal asked. It's Official --- Saudi Women Drive!!!!! Nine years after I started this little blog, I am so happy to be at my computer, counting down the minutes until women in Saudi Arabia will be able to drive legally. Over all these years, reading about the issue from so many angles, it was still such a delight to learn the news last September that the ban would be lifted at last. And now the day is here. People are sending out tweets of congratulations. Women are tweeting that they are getting ready to drive. Others are tweeting to women to take the responsibility of driving seriously. And the world watches. Another tweet mentions that filming and photographing women drivers in order to mock them is forbidden and punishable by fines and even prison. I trust that cool heads will prevail and people will be mature about this change. Fortunately, Saudis like to stay up late, so I think those who go out driving in 47 minutes (yikes it's coming up soon) will find that there a lots of people on the road. I hope there will be some peaceful celebrations and ululations (zaghareed). My novel, A Caravan of Brides, has a chapter in it imagining that on the first day of women driving (set in 2018 by pure luck) that women stand on the steps at the Traffic Department and let out zaghareed. I don't think that will happen tonight, but maybe someday. Now it is nine minutes to midnight. Now it is two minutes. I eagerly await coverage of the day, especially what people post about their first drives. It is so wonderful to be alive to see this change take place. And now, the moment has arrived. Congratulations and Hallelujah!!!!! The June 21, 2018 English language daily, the Arab News, reported on women getting ready to drive. You can link to the story here, and the text is pasted in below. Just five days ahead of women being able to drive in Saudi Arabia, Reuters published this story on June 18, 2018. A link to the story is here, and the text is pasted below. Note: I am unable to reproduce the images from the story so you'll have to go to the link to see them. DHAHRAN, Saudi Arabia (Reuters) - On June 24, when Saudi women are allowed to drive for the first time, Amira Abdulgader wants to be sitting at the wheel, the one in control, giving a ride to her mother beside her. "We need the car to do our daily activities. We are working, we are mothers, we have a lot of social networking, we need to go out - so we need transport," she said. "It will change my life." Women make up about five percent of Aramco’s 66,000 staff, meaning that 3,000 more could eventually enroll in the driving school. Last September, King Salman decreed an end to the world’s only ban on women drivers, maintained for decades by Saudi Arabia’s deeply conservative Muslim establishment. But it is his son, 32-year-old Crown Prince Mohammed bin Salman, who is the face of the wider social revolution. For Abdulgader, June 24 will be the day to celebrate that change, and there is only one person she wants to share it with. On June 14, 2018, the Saudi English language daily the Arab News reported this story. A link to the story is here, and the text is pasted in below. Story by Ashleigh Stewart in The National on June 11, 2018, about the first European and the first American women to get drivers licenses in Saudi Arabia. You can link to the story here, and read the whole article below. Note: the linked story has some great images. I couldn't capture them all here. Laura Alho and Kelly Downing show off their new driving licences in Riyadh. Abdul Ahad for The National. Sheer determination: that's what friends Kelly Downing and Laura Alho believe got them two of the first driving licences issued to foreign women by Saudi Arabia. The pair had been keen to get their licences as soon as possible after Saudi authorities announced the ban on female drivers was to be lifted. However, they didn't quite expect to become the first westerners to receive them. "It still feels very surreal. It's very exciting," Ms Alho told The National. "I have been waiting for this thing forever." She even owns a jacket with "June 24 2018" — the date she will finally be able to use her new licence — and the corresponding date in the Islamic calendar, embroidered on the back. The positive impact on Saudi women becoming drivers has been widely acknowledged. But it is also going to influence their foreign compatriots — those who may have already been drivers in their home countries. Ms Alho is in her 11th year of living in the kingdom. She arrived as a single Finnish woman to take up a nursing job. Now she is married with two children, running a full-time Saudi-focused travel blog. Ms Downing moved from the suburbs of Washington DC to Riyadh in late 2012, after her Saudi husband finished his MBA. She met Ms Alho through mutual friends months later, and the pair have been excitedly watching the succession of reforms in the country ever since. Driving licences were issued to 10 Saudi women last Monday, just weeks before Saudi Arabia's ban on female drivers is to be lifted on June 24. The Ministry of Information said another 2,000 licensed female drivers would join their ranks this week. "It's been a rapid rise of changes recently," Ms Downing said. "The ways things are currently, I'm very, very happy to be here. "Having the ability to choose is wonderful, I don't miss going to movies or sports stadiums, but driving has been a big thing for me." The two friends made sure they were among the first to register when the system for booking appointments opened on May 21. They opened their Absher accounts on the Ministry of Interior website, submitted their documents — including a medical report and translations of their foreign licences — and managed to book the first spots on the first day expats with foreign licences could have their paperwork converted. "As soon as I saw that the system was up for appointments, I woke my husband before prayer and said I had to do it," Ms Downing said. "He knew from the beginning that I wanted to be the first, so he helped me navigate the websites and get everything in order and everything submitted correctly." However, a couple of days later their appointments were cancelled as the system was not ready. Laura Alho's jacket counts down to the day she'll be able to finally get behind the wheel. Abdul Ahad for The National. Last Tuesday, they both received messages at night saying their appointments had been scheduled for the next morning. Ms Downing was scheduled for 11.20am, soon after the traffic department opened, and Ms Alho was scheduled for soon afterwards. After having their thumbprints taken and licence information entered into the system came a short driving test around a course in the car park. It lasted only a couple of minutes, Ms Alho said. She had to demonstrate a three-point turn and a parallel park as the driving instructor watched from outside, following the car along the course. "Laura arrived moments after I was handed my licence and it was incredible to hug her and share my happiness in that moment," Ms Downing said. "It was so straightforward, it was amazing. I was prepared to wait all day if I had to, but everyone was in a great mood. I keep saying it's the best DMV experience I've ever had." "The guy gave me the thumbs up, but then I went back inside he said to my friend 'you passed' and to me, 'you didn't pass'," Ms Alho said. "And I said are you serious? He said 'no, of course you passed'." When they collected their new licences moments later, they asked whether they had indeed managed to be the first expatriates to get their licences. They were told they had, being the first American and first European respectively, with several Saudi women and one Lebanese woman just sneaking in before them that day. "It felt incredible, I was just so happy. It means so much for my life here. I already have a say in my life because my husband gives me a say, but now I'm independent and I can leave the house without worrying about a driver," Ms Downing said. Ms Alho agreed. "I think it's a really great time to be here, it's such a historic moment and we've been waiting for so long," she said. "It's going to make such a huge difference in everyday life. You can do spur-of-the-moment things, like going to restaurants or to the park. You always had to plan those in advance before." And, come June 24, the duo have agreed that, whether it be a road trip or simply taking in the sights of Riyadh, they'll be on the road somewhere, together. 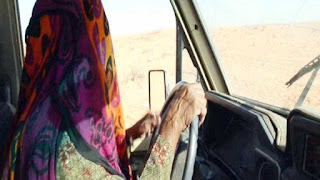 Women in rural Saudi Arabia have been driving for years. This June 8, 2018 story from Okaz and Saudi Gazette was picked up by the western media. Here is a link to the story and the text (her picture too) are pasted in below. The story is by Ali Al Robai. AMSA Hathel was the first Saudi woman to drive in the southwestern Saudi province of Al-Baha around 40 years ago and today she is the first Saudi woman in the region to get a driver’s license. “I have been driving for the last 40 years and never have I made an accident or broken traffic rules. I always drive on the outskirts of the city near where I live and never in my life have I been criticized by any of the residents,” she said, adding that she learned how to drive by herself and nobody taught her. 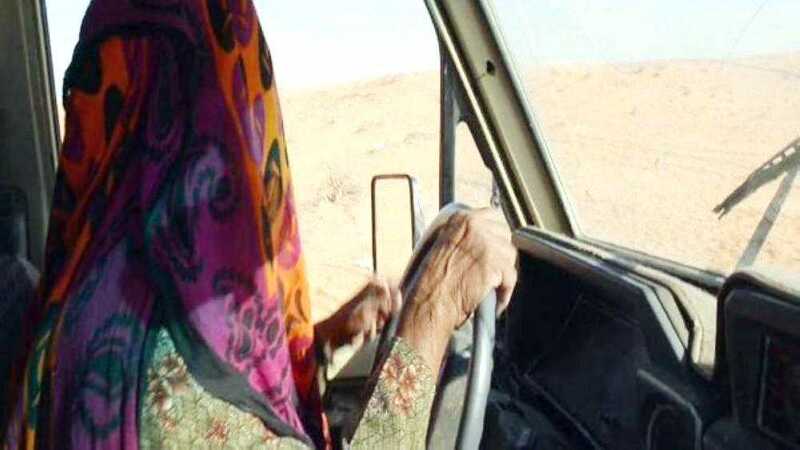 Amsa, who is over 60 years old now, is happy that women in the Kingdom will finally be able to drive and enjoy one of their basic rights granted to them by the country's law. Amsa said when she was young, she used to ride with her uncle and run errands. She picked up driving skills from him and learned to fix the car if it broke down. The harsh life of the village and her mother’s illness encouraged her to learn driving because she had to drive her mother to the hospital on a monthly basis. She would use unpaved roads to avoid being spotted by traffic officers. Her father died long time ago leaving them alone. She told her future husband that she would only marry him if he allowed her how to drive. And he did, but her husband had to move to Riyadh later, leaving her on her own. But Amsa managed to fend for herself by driving on a daily basis. “I always drive carefully and never engage in any behavior that might risk road safety,” she said. On June 5, 2018, the Saudi Gazette reports reactions to the first Saudi women being granted drivers licenses. A link to the story is here and the text is pasted below. JEDDAH — Many Saudis celebrated the historic day when Saudi Arabia began issuing its first driving licenses to women on Monday. “Ten Saudi women made history on Monday when they were issued driving licenses,” said the Information Ministry’s Center for International Communication (CIC). The video of the first Saudi woman Ahlam Al-Thenayan receiving her driving license at the General Directorate of Traffic went viral on social media. Wafa Mohammed Humaid enthusiastically shared her new ID calling it a historic day and is waiting for the next historic moment when women start to drive in the Kingdom. Commenting on the number one trending news on Twitter, media personality and writer Nawal Al-Jabr told Saudi Gazette that she plans to enroll in a driving school and learn how to drive. “The royal decree allowing women to drive aims at reinforcing the Saudi woman’s status and position in society and enabling her to be an independent and productive citizen enjoying all her rights,” said Al-Jabr, a full-time working manager who lives with her husband and son. In a poll of some 350 respondents about their plans for driving, around 37 percent said they are eager to join a driving school to learn driving while others said they either have an international driving license or don’t wish to drive. The Ministry of Interior has created a specific website (www.sdlp.sa) for Saudis and expats to register for the issuance and replacement of licenses. “Dear sister, you need to register in Abshir to benefit from all services,” says the portal asking users to apply online through Abhsir for the replacement or issuance of licenses. 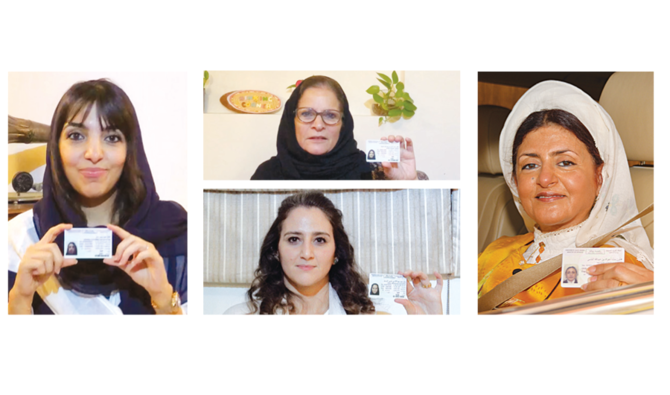 On June 5, 2018, the BBC reports about the first ten licenses being granted to Saudi women who had international drivers licenses and who passed a driving test. A link to the story is here, and the text is pasted in below. Ten women swapped their foreign licences for Saudi ones on Monday in cities across the country. However, women's rights activists have complained of a new crackdown - with several being arrested. A flood of applications is now expected in the run-up to 24 June when the ban will end. But rights groups in the kingdom have campaigned for years to allow women to drive, and some women have been imprisoned for defying the rule. Several activists, men and women, were arrested last month, accused of being "traitors" and working with foreign powers. Loujain al-Hathloul, a well-known figure in the campaign for women's driving rights, was believed to be one of those held. Rights group Amnesty International described the arrests as "blatant intimidation tactics". On Sunday, Saudi prosecutors said 17 people in total had been detained, but said eight had been released "temporarily". "Expectations are that next week an additional 2,000 women will join the ranks of licensed drivers in the kingdom," a statement from the Saudi information ministry said. It added that the 10 women who had collected their new Saudi licences had "made history". "It's a dream come true that I am about to drive in the kingdom," Rema Jawdat, who received a licence, was quoted as saying by the ministry. "Driving to me represents having a choice - the choice of independent movement. Now we have that option." The lifting of the driving ban was announced last September and is part of Crown Prince Mohammed bin Salman's programme to modernise some aspects of Saudi society. He has spearheaded the Vision 2030 programme to diversify the economy away from oil and open up Saudi society. But there are still limits on what Saudi women can do. Today, June 4, 2018, is another historic day - one of many for Saudi women. Al-Arabiyya.net reports on the video of the first Saudi woman to receive a driving license. A link to the story is here, and the story is pasted in below. storic moment unfolded in Saudi Arabia on Monday when, after months of preparations, the first driving license was issued to a woman. A video, that quickly went viral, showed the woman being handed over the driving license by the officials. “Thousands of congratulations to the daughters of the homeland, being issued the first license in Saudi Arabia,” the tweet read. Earlier last month, the date of the issuing of licenses was announced. Saudi women will be allowed to start driving in the kingdom from June 24, the General Department of Traffic Director General Mohammed al-Bassami had then said. In September 2017, a royal decree announced the end of a decades-long ban on women driving — the only one of its kind in the world. Women 18 years of age and older will be allowed to apply for a driver's license, Bassami said. Driving schools for women have been set up across five cities in the kingdom, and teachers will include Saudi women who obtained their licenses abroad. Women with foreign driving licenses will be able to apply for a local one through a separate process, which will also assess their driving skills. "It is no secret that many women in the Kingdom of Saudi Arabia hold driving licenses from abroad," the statement added. Crown Prince Mohammad Bin Salman, 32, is seen as the force behind the lifting of the ban, part of a series of reforms being pushed. His Vision 2030 reform plan for a post-oil era seeks to elevate women to nearly one-third of the workforce, up from about 22 per cent now. Likely a result of bad timing (magazines printing schedules require lead time), the Vogue Arabia cover story celebrating Saudi women hit a sour note with some observers. On May 31, 2018, Megan Specia of the New York Times reported. A link to the story is here, and it's pasted in below. That’s how Vogue Arabia described its June cover, which features a glamorous woman behind the wheel of a classic car, parked in the desert. But the problem for some has been which woman the magazine decided to put in the drivers seat in an issue that “celebrates the women of the kingdom and their wide-reaching achievements,” but makes no mention of the country’s most recent crackdown on women’s rights activists. Princess Hayfa bint Abdullah al-Saud — one of the late King Abdullah’s 20 daughters — sits behind the wheel, even as some prominent female activists who fought for the right for Saudi women to drive remain locked behind bars. In mid-May, at least 11 activists were arrested and labeled “traitors” by the Saudi government, a move that surprised many as the country is just weeks away from allowing women to drive. Some of the activists have been released, but others remain detained. The Saudi crown prince, Mohammed bin Salman, announced in September 2017 that the notoriously conservative nation was lifting the ban on female drivers as part of a reform effort. Saudi women have long been restricted in most aspects of public life, from what they can wear to where they can travel, in part because of the country’s strict guardianship laws. On June 24, Saudi women will legally be able to drive for the first time. But critics say the Vogue coverage fails to highlight some Saudi women whose activism helped draw international attention to the issue, and who now face persecution. The issue does feature Manal al-Sharif, one of the Saudi activists who took part in the 2011 protests against the restrictions and was later arrested for the action, but does not mention the latest arrests. Twitter users were swift in their reaction, calling out Vogue Arabia for what some saw as an oversight. Others photoshopped faces of two detained women’s rights activists, Aziza al-Yousef and Loujain Hathloul, over the face of Princess Hayfa. Both women are still being held by Saudi authorities, according to Human Rights Watch. Others voiced support for Vogue Arabia, including Ms. Sharif, the activist featured in it. She said she was happy that her “country women are being celebrated” — but also urged readers not to forget the detained activists. Vogue Arabia launched in November 2016, with a staff of 25 and a headquarters in Dubai. One of a series of pushes into new and potentially lucrative foreign markets by the magazine publisher Condé Nast, the new title was pitched as a digital-first, bilingual effort to attract the hearts, minds and money of women in the 22 countries of the Arab League. Saudi Arabia makes up most of the readership, Vogue Arabia said. This May 28, 2018 story ran in the English language daily, the Saudi Gazette. A link to the story can be found here, and the text is pasted in below. RIYADH — Director General of Traffic Department Maj. Gen. Muhammad Al-Bassami has refuted contents of a statement published in one of the electronic newspapers on Thursday about procedures for swapping foreign licenses held by women drivers. The statement was attributed to a Traffic Department source. Maj. Gen. Al-Bassami said the tests for women holding foreign driving licenses and replacing foreign driving licenses with Saudi ones would begin only when preparations are complete. The report claimed that foreign women visiting the Kingdom would be allowed to drive for a year if they have international driving licenses. It said women visitors will also be allowed to drive if the driving licenses they hold are recognized by the Traffic Department. They can drive for a year or until the expiration of their driving licenses, whichever comes first. The report said the Traffic Department has started exchanging international driving licenses held by women with Saudi licenses and has set up a number of centers in various parts of the Kingdom for the purpose. While refuting the claims published by the newspaper, Maj. Gen. Al-Bassami stressed the importance of sourcing information regarding public affairs to official spokesmen of the concerned departments. The Saudi English language daily the Saudi Gazette reports on May 27, 2018 that women are gearing up to get their driving licenses. A link to the story is here, and the text is pasted in below. JEDDAH – The countdown for women in Saudi Arabia to start driving has begun. Saudi authorities are scheduled to lift a decades-old ban on women driving in the country as of June 24. As the date is drawing near, centers training women how to drive in Jeddah and other cities have been struggling to cope with the big turnout of prospective female drivers who have been enthusiastically responding to the historic decision by the Kingdom. While Saudi women are making preparations to enter a hitherto male domain, training centers have started intensive programs to instruct them on traffic regulations and driving skills so that they qualify for a Saudi driving license, Al-Hayat Arabic newspaper said in a report on Thursday. The registration is open for all women who fulfill the required conditions announced by the Traffic Department. The Jeddah Driving School for Women has a total of 125 trainers. The woman trainee can choose the time that suits her from the given training schedule, Al-Ghamdi said. In late 2017, an agreement was signed between KAU and the Traffic Department to set up the first women’s driving school in Jeddah governorate. The school will award recognized driving certificates. At that time, the Traffic Department had made it clear that there would be no difference between the number plates of cars driven men and women. All cars will be subject to the number plate regulations in force at present, according to Article 7 of the Traffic Regulations. The conditions for the photo to be used for a woman’s driving license are the same as those for male drivers. The royal decision stipulates implementation of the rules for Traffic Regulations and their executive bylaws on both male and female drivers alike. Licenses were granted to five driving schools exclusively for women in Riyadh, Jeddah, Dammam, Madinah and Tabuk. At present, applications for opening other driving schools are being studied in different Saudi cities and governorates. Preparations are under way to issue driving licenses to women who complete their training programs and to replace international and foreign licenses held by female drivers, provided these licenses are recognized by Saudi Arabia, as stipulated by the Traffic Regulations and their executive bylaws. All licensed women’s driving schools have seen huge turnouts of women keen to learn how to drive. The Jeddah Driving School for Women at KAU has completed final preparations to begin training. The driving school has set up a website that provides guidance to Saudi women on licenses; how to renew or replace them, a general idea on the Traffic Regulations and basic driving skills. The school confirmed that it has not set the fees for practical training, despite accepting the applications from the prospective trainees. What it provides now is electronic training only, which includes theoretical aspects of training, giving the trainee a general idea on the driving licenses, their types and the traffic violations that will lead to the withdrawal of the driving license. It also deals with getting women ready to drive in various conditions, and how to tackle hazards by following the steps for safe driving. The school said in order for a female trainee to obtain a driving license, she must undergo a medical check-up at a recognized medical center, attend the lectures on theoretical aspects of driving and attend written and practical exams. She must obtain a document certifying that she has passed the examination. She will then take this document to the Traffic Department to be issued a driving license. Ava Batrawy reports for the Associated Press on May 22, 2018. A link to the story is here and the text is pasted in below. Saudi Arabia's arrest of 10 women's rights advocates just weeks before the kingdom is set to lift the world's only ban on women driving is seen as the culmination of a steady crackdown on anyone perceived as a potential critic of the government. The activist in her late 20s is among the most outspoken women's rights activists in the kingdom. She was detained for more than 70 days after she attempted to livestream herself driving from neighboring United Arab Emirates to Saudi Arabia in 2014. She was detained by Saudi authorities as she attempted to cross the border and referred to an anti-terrorism court on charges of criticizing the government online. She was later released without trial. Activists say al-Hathloul was arrested again in June of last year in connection with her advocacy. Activists say al-Hathloul was then stopped by authorities in Abu Dhabi, where she was residing, and transferred to Saudi Arabia earlier this year where she's been under a travel ban since March. A retired professor at King Saud University, al-Yousef is a mother of five and a grandmother of eight. Although she hails from a conservative tribe with links to the royal family, she is among the most prominent women's rights activists in Saudi Arabia. In 2016, she delivered a petition signed by thousands to the royal court calling for an end to guardianship laws that give male relatives final say over a woman's ability to marry or travel abroad. She has worked for years assisting women fleeing abusive marriages and homes. She also defied the kingdom's ban on women driving on several occasions. "This is a good step forward for women's rights," al-Yousef told The Associated Press last year when the kingdom announced that women would be allowed to drive. However, she cautioned it was just "the first step in a lot of rights we are waiting for." An assistant professor of linguistics and mother of four, including a toddler, al-Nafjan runs one of the first English blogs on Saudi Arabia. She describes the "Saudiwoman" blog as an effort to counter the many non-Saudis and non-Arabs "out there giving 'expert' opinions on life and culture" in the kingdom. Al-Nafjan has protested the driving ban, including publicly driving in the capital, Riyadh, in 2013 as part of a campaign launched by women's rights activists. She has worked closely with al-Yousef and other women's rights activists to help domestic abuse victims and bring attention to repressive guardianship laws. A longtime advocate of women's rights, she took part in the kingdom's first driving protest in 1990 and subsequent campaigns to end the ban on women driving. She has faced years of harassment by authorities, including house raids, travel bans and being fired from her job. Last year, al-Ajroush told the AP after women were promised the right to drive: "I had no idea it was going to take like 27 years, but anyway, we need to celebrate." Like al-Ajroush, the 70-year-old al-Mana took part in the kingdom's first driving protest in 1990, in which 47 women were arrested. She also took part in driving protests in 2011 and 2013. She is director of Al-Mana General Hospitals and the Mohammad Al-Mana College of Health Sciences. She completed her bachelor's and master's degrees in the U.S. in sociology. In 1980, she became one of the first Saudi women to obtain a Ph.D., also in the U.S. from the University of Colorado. He's also represented Waleed Abulkhair, a human rights lawyer now serving a 15-year sentence who'd represented Raif Badawi, a blogger who was publicly flogged in 2015 and is serving 10 years in prison. A longtime women's rights activist who took part in the kingdom's first driving protest in 1990, al-Sheikh is a professor at King Saud University and volunteers with Saudi-based charities focusing on women and children. She hails from the prominent Al Sheikh family who are descendants of Sheikh Mohammed Ibn Abdul-Wahhab. His ultraconservative teachings of Islam in the 18th century are widely referred to as "Wahhabism" in his name. She co-authored a 100-page study that was published this year by the Center for Women's Global Leadership in partnership with Rutgers University, examining Saudi women's advocacy since 1990. The study says questions remain over whether new policies will lead to real changes in how women's lives are governed in Saudi Arabia. The study notes that international media exposure "can be a protective shield against severe punishment for active engagement in women's causes." In an interview previously aired on France24, al-Shubbar is quoted as saying that in Saudi society "men are viewed as superior to women, and men are seen as capable of achieving anything and a woman is not." Al-Rabea is a writer and an activist in his 20s who has organized discussion groups about philosophy and social issues. He worked with some of the activists to push for greater women's rights. The Gulf Center for Human Rights describes al-Meshaal as a businessman and philanthropist who was listed as a board member in an application by activists to the government to establish a non-governmental organization called "Amina" to protect women survivors of domestic violence. On May 19, 2018, the Saudi English language daily, the Saudi Gazette reported on village women in Saudi Arabia's southwestern region. You can link to the story here, and it's pasted in below. Rural women have learned to drive over the decades, but are glad to have it become officially legal. The date, the 10th of Shawwal, is June 24, 2018. A number of women from the southern part of Saudi Arabia are waiting for the 10th of Shawwal when women will be allowed to drive. NAJRAN — A number of women from the southern part of Saudi Arabia told Okaz that they are waiting for the 10th of the month of Shawwal when women will be allowed to drive. That date will mark the end of the era of driving in fear and secrecy in rural areas and far away from the road. This time, they will be driving in city roads without any fear. They told Okaz that they would be adhering to the rules and regulations of the road, and they even consider themselves strict followers of the rules than men. A Saudi women, who did not mention her name, said that she has been driving from when she was 16 years old, but she only sat behind the wheel if the car was far away from the city and away from police eyes. When she became old, she was the only one who was able to drive. She was transporting her parents to the hospital and health centers and to the social insurance department. Her younger children are also dependent on her to driverthem to school every day. She said that driving the car was a dream for women living in villages until the decision by the Custodian of the Two Holy mosques came. She said now women can take care of their daily needs. The BBC reports on a smear campaign against Saudi women driving activists who have been detained. Manal al-Sharif is interviewed in the story. Link to it here, and the story is pasted in below. as similar to the campaign that targeted the movement in 2011. On May 18, 2018 the Washington Post broke the story that activists supporting women driving in Saudi Arabia had been detained. This story from the UK's Telegraph has now published it to. A link to the story is here and the text is pasted below. Saudi Arabia has detained several prominent female activists who campaigned for women’s right to drive, taking them into custody just weeks before the decades-long driving ban finally comes to an end. Human rights groups said Loujain al-Hathloul, Eman al-Nafjan and Aziza al-Yousef - three of the most prominent voices demanding women be free to drive - were all detained on Thursday. Two male advocates for women’s rights were also detained, activists said. The activists were detained as Saudi Arabia prepares for the driving ban to come to an end on June 24. The policy shift has become a symbol of the modernising drive of Crown Prince Mohammed bin Salman, and the Saudi government is eager for positive media coverage of the move. The detentions appear to be an effort by Saudi authorities to make sure they do not have to share credit for the end of the driving ban with activists who spent years campaigning for it. They may also be concerned that the women right’s campaigners would use the end of the driving to call for further advances in women’s freedom - like an end to the male guardianship system that severely limits Saudi women’s ability to travel independently. Neither Ms Narfjan nor Ms Hathloul could be reached for comment. Ms Hathloul told The Telegraph earlier this year that shortly before Saudi authorities announced the end of the driving ban in September she was warned not to speak publicly about it. Instead, she Tweeted just the word “Alhamdulillah” in Arabic, or “Praise be to God”. Ms Hathloul had been detained twice before for her activism. She and other Saudi women sometimes filmed themselves driving in defiance of the ban and published the videos online, to the fury of the government. Ms Hathloul was voted the third-most powerful Arab woman by Forbes in 2015, but was forced to quit her job that same year because of driving restrictions. Her husband, a well-known Saudi comedian who acts as her male guardian, was often out of the country meaning she had to pay for taxis to and from work. It was not clear if she or any or any of the other activists had been charged with a crime. Prisoners of Conscience, a human rights group, said that two men - Mohammed al-Rabjah and Ibrahim al-Mdmyegh - had also been arrested. The driving ban has been in place since 1979 and women’s rights activists have been fighting it against for it for decades. In 1990, around 50 women launched the first high profile protest by driving in a convoy around Riyadh. They were eventually stopped by police. The Saudi government under the leadership of Crown Prince Mohammed has shown itself willing to use detention as a tool against political rivals. Dozens of princes and prominent businessmen were arrested in November and detained at the Ritz-Carlton hotel in Riyadh on allegations of corruption. Most were released only after agreeing to pay large sums as part of a settlement with the authorities.